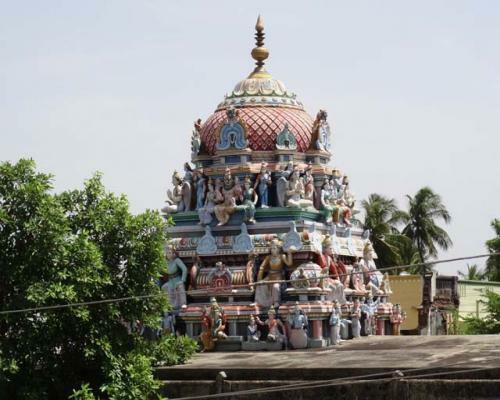 Kazheesirama Vinnagaram or Tadalan Kovil is a Hindu temple dedicated to Lord Vishnu located in Sirkazhi in Nagapattinam district, Tamil Nadu, India. 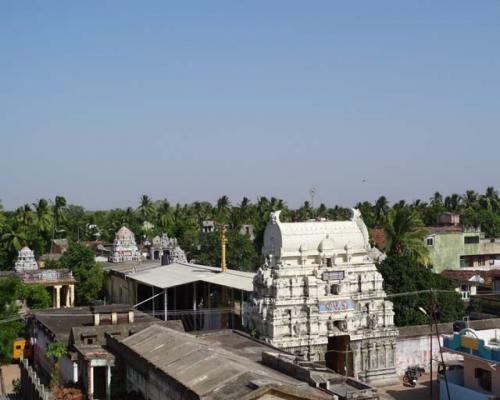 It is one of the "Divya Desams", the 108 temples of Vishnu revered by the 12 poet saints, or Alwars. This is one of the five Divya Desams referred by Thirumangai Azhvaar as ‘Vinnagaram’. The others being Parameswara Vinnagaram (Kanchipuram), Arimeya Vinnagara(Thiru Naangur), Vaikunta Vinnagaram (ThiruNaangur) and Nandipura Vinnagaram(Nathan Koil, Kumbakonam). Another feature of Thirumangai’s praise of this Divya Desam is his reference to the Goddess in his Paasurams. Lord Trivikrama appears in the sanctum sanctorum with His left leg above His head, showing the right hand as if to receive the Dhan and a finger of the left hand as if asking for the next one foot land promised to him. This is the Trivikrama form of Lord Vishnu. The Vimana above the sanctum is called Pushkala Vimana. Procession deity Thadalan is nearby. He is also praised as Thavittu Panai Thadalan. Thal in Tamil means Earth or World, Aalan means the ruler. As Lord scaled the world with His Foot, Sri Andal called Him Thadalan. The verses of Sri Andal are pieces of delight with sweet melody of Tamil coupled with their spiritual content. Nearby Andal is Lord Santhana Gopalakrishna. Those seeking child boon pray here. Glory of Mother: Lord Vishnu’s handsome chest is the abode of Mother Sri Mahalakshmi. In this temple, Mother is holding the Lord on Her chest. As Lord stands here with one leg on the ground, to help Him balancing, Mother is holding the Lord so that He should not feel the pain of standing by one leg. The Kausthuba gem chain on the Lord’s chest is therefore on that of Mother, a rare darshan. Women pray here to earn the love of their husbands. The darshan also brings re-union among couples separated. Procession Mother is hiding the main mother leaving only Her face for the devotees who is holding Her Lord. Swing festival is conducted on each Friday in the shrine. Sirkali has the special reputation of being the birth place of Saivite Saint Tirugnanasambandar. There was a time when the temple was left without proper care. During those days an old women kept the procession deity Thadalan hidden in a husk pot-Thavittu Panai in Tamil, performed pujas and was worshipping Him. Saint Tirumangai Azhwar came to this place along with his disciples singing the glory of Lord. People there requested them to pass without making noise. But they refused and continued singing. War of words began. It was decided to have a debate the next day between Sambandar and Azhwar. Lord appeared in the dream of Azhwar and asked him to get Thadalan from the old woman, pray to Him and go for the debate. Sambandar asked Tirumangai Azhwar to say a Kural. Kural in Tamil means a dwarf. Lord came to Mahabali as a Kural and became Trivikrama then. Having this theme, Azhwar began his song with the word Kural and sang 10 verses describing the ten incarnations of Lord Vishnu. Sambandar was very happy and rewarded Azhwar his Vel and also an anklet. Tirumangai Azhwar restored the temple to its original glory then. 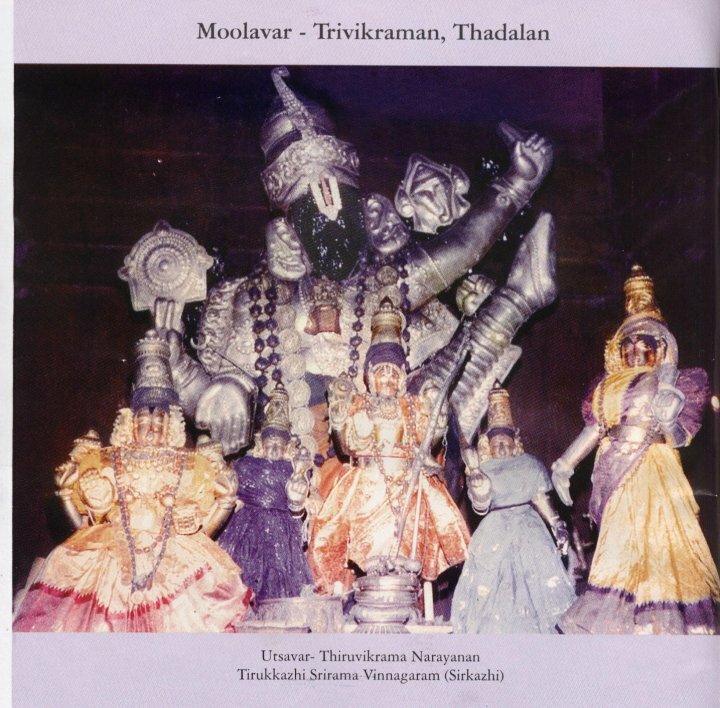 He sang in praise of Lord, Mother and Thadalan and Sage Romesa who was instrumental to make the presence of Lord Trivikrama in this temple with his Mangalasasanam. Lord Brahmma the creator grew proud of his boon of longevity spanning many Yugas. Lord Vishnu decided to teach him a lesson. Sage Romesa performed penance here for the darshan of Lord Vamana-Trivikrama form scaling the whole world with one Foot up. Granting his wish, Lord told the sage that he would live longer than Brahmma whose longevity would be reduced by a year if and when one hair fell from his body. Brahmma understood that Lord has indirectly taught him a lesson and shed his pride. Thus Lord graced this place with His Trivikrama form. Devotees pray for success in endavours, promotion in jobs and longevity. Devotees offer Tulsi garlands, vastras and sweet pudding as nivedhana. Lord Perumal in His Vamana Avatar form is in the front mandap with his right hand receiving alms, holding an umbrella in His left hand and wearing the Salagrama garland. Devotees realizing their wishes offer their prayer commitment to Perumal. Saint Tirumangai Azhwar is nearby with his Vel and anklet in the feet. As Perumal scaled the whole world by one foot, those performing Vastu Puja place the sand of their land at His feet praying for all prosperity. There is also a shrine for Lord Sri Rama in the prakara and one for Sri Anjaneya outside the temple. Two pujas are performed for Golden Garuda. Lord Sattainathar temple where Mother Parvathi fed Saint Gnana Sambandar is also nearby. This is one of the 108 Divya Desas of Perumal. The temple is 2 km from Sirkali bus stand on the Chidambaram route. Frequent buses from Madras, Chidambaram and Kumbakonam.